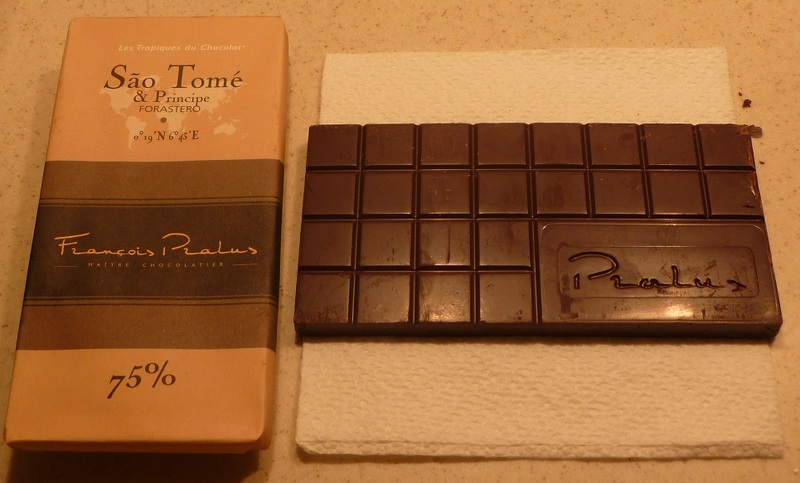 The Sao Tome bar is one of a family of single-plantation chocolates from Pralus. I got this bar as a Christmas present from my daughter Rachel (have I mentioned that she works at Zingerman’s?). It’s about the only way I would get one, since I’m genetically predisposed not to spend $10.00 on a chocolate bar. But after sampling it, I think my DNA has been rewritten. The wrapper is a pleasing combination of subtle browns, which to me lends elegance to the package. It does not scream for attention, but lies there waiting to be seen and studied. 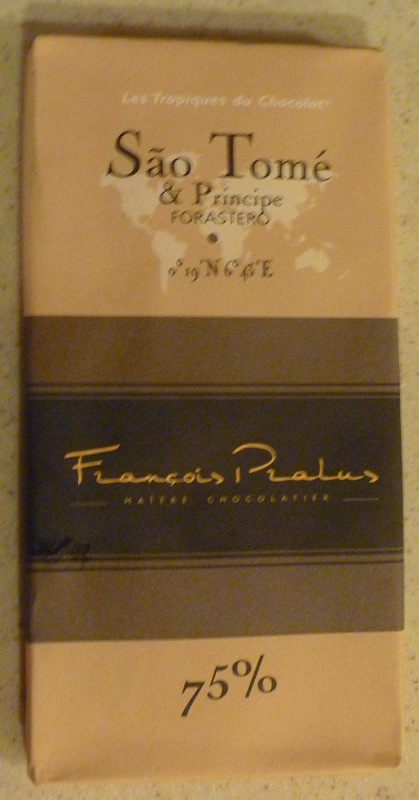 The other Pralus bars look similar on the outside, so there’s nothing that says “Pick me” about the Sao Tome. But Rachel, who has sampled them all, deems it the pick of the litter. The chocolate has a nice sheen to it, and the “Pralus” in the right corner provides distinction and breaks up what would be an otherwise ordinary small block pattern. The bar snaps cleanly and dissolves rapidly and smoothly in the mouth. Very creamy mouthfeel. With a 75% cocoa content, you’d expect deep chocolate flavor at first, and that is what you get. It is definitely intense, but not at all bitter. After that, a sweetness emerges that becomes fruity in nature and lasts to the finish. The best part of high quality chocolate is that you don’t need much to be satisfied, and the Sao Tome fits that bill. Just a few squares is enough for me at any one time. I can actually put the bar down without longing glances at the rest of it, knowing it will be there for me later. Rachel: This is the best chocolate bar I’ve ever had. ‘Nuff said. This entry was posted in Cooking, The Amateur Chocoholic and tagged bar, chocolate, dark chocolate, Pralus, review, SaoTome, single plantation, Zingerman's. Bookmark the permalink. I LOVE the response from Mom/Grandma!!!! By the way, it occurred to me that the cost of one square is roughly 1/3 of a dollar. Now that’s just not fair!!! I’m reading this before dinner. I want one little square so I can try this out of this world chocolate. If I agree with the judges, then you can pool your pennies and buy me a WHOLE BAR.